Striking the iron while hot has never been my forte. So a good two weeks after all the buzz surrounding the #BNLF Indiblogger meet at Dehradun has died down, I decide to do my own post on it! 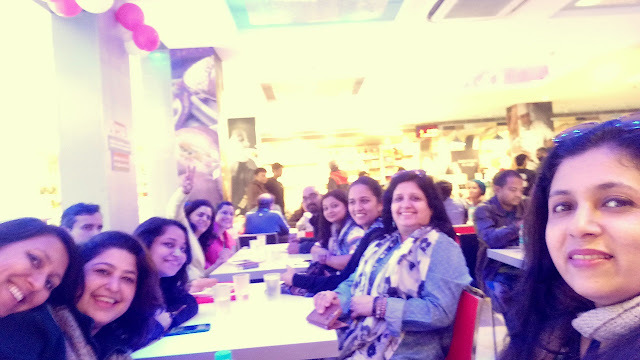 A bloggers meet in Dehradun sounded like a manna from heaven for the desperately-in-need-of-a-holiday me! I jumped at the opportunity and booked my flights and hotel stay in Dehradun. The BNLF (Blog Now, Live Forever) meet organizers, Indiblogger (IB) in association with The Valley of Words (VoW) had promised the attendees of some memorable experiences. At the very outset, IB made it very clear that the bloggers attending the event would be doing so at their own cost, both travel and stay-wise. This was a no draw for the majority blogging community. Still a reasonable size of people, yours truly included were determined to make it to the event. Let me warn you that if you are expecting a blow by blow account of the events at the venue, I am surely going to disappoint you. Diligent bloggers have done a fair job of it already. Late-latifs like moi, are here only to Relax-N-Rave. A bit of fun, relaxation in the cool environs, meeting virtual contacts and nothing else. A whole lot of fun. Made the best of pals, when I'd kinda given up on forging close new bonds. A realization that great experiences don't solely come from best organization and immaculate planning. The meet can be best described as resembling a last minute plan by collegiates (IB), chaperoned by a warden (VoW), where you never knew what trick or treat awaited you! But hey, if you really went to college, you'll realize that your most memorable trips were made by well-meaning gaffes, an integral part of the wonder years! The IB team had inadvertently let out on what to expect when they tweeted a day before the event that they were like headless chickens! And at the risk of being forever ostracized by the IB team, I shall proceed with my account of the experience. The initial registration and distribution of a welcome kit was followed by dinner in the open lawns. I was thrilled to meet fellow bloggers I'd only known virtually. Many new names, new faces yet all eager to connect. By a stroke of luck, well before the meet, we'd created a small group of prospective attendees. This was the best thing we could have done! Our lil group was an island of refuge in the sea of bloggers...err, sea is a hyperbole for the turnout! 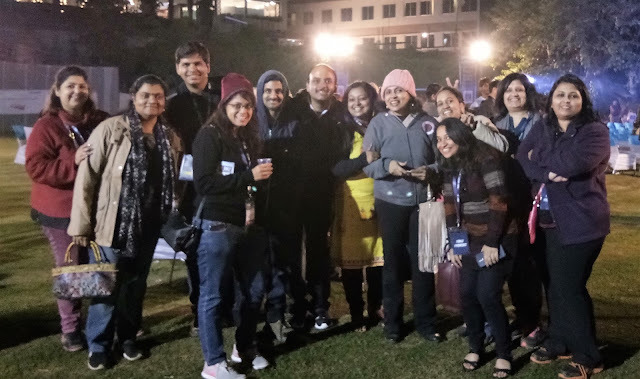 So there we were in the open lawns, comfortably shivering in our seldom used woolens brought out in honor of the event, clicking away selfies and groupies. The undercurrent of discontent over the ill-famed dinner coupons got lost somewhere between the soulful country numbers belted out by the versatile Bobby Cash, the lovely open air ambiance and classic North-Indian fare! Time to herd into the warm conference room made cozier with the IB crew's special cocktail punch. I think this cozy meet was the most memorable part of the BNLF for me. Anoop and Renie the stalwarts of IB, were visibly distressed by the way things had proceeded thus far. Their heartfelt apologies and promise to make things better made everyone in the room realize that we were in this thing together. The blogging community however far it has come today is still meted a step-motherly treatment by a world dominated by pro journos, published writers and authors. 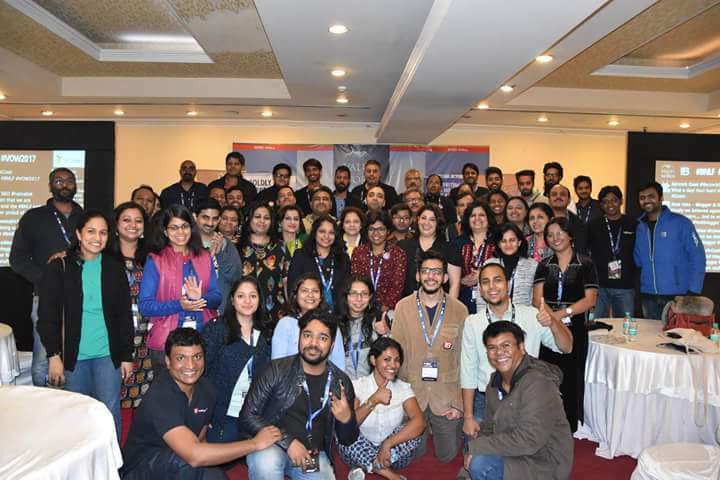 The BNLF meet was/is a statement of coming together, of melting differences and standing in solidarity, supporting an upcoming super-power - Bloggers and Blogging! Individual introductions broke the ice and eyebrows shot higher as we came to know more about the blogging superstars amidst us. Already things were looking up with this meet! As promised, the IB team ensured people got dropped safely to their respective hotels from the venue on both nights. The early morning much hyped Ruskin Bond Walk happened along the dusty, pleasantly nippy streets of Dehradun. Here, I blank out the relevant details of this walk to more attentive bloggers' accounts of the same. For me the walk was more about enjoying the weather, the company of new friends and building up an appetite for breakfast! Breakfast at Bikanerwala was sumptuous, calories have a way of soothing ruffled feathers like no other way! Post breakfast, people split up with their own pre-planned agendas of exploring the Doon valley. With Anoop's help, our group got a mini-van for the sight-seeing expedition, the best decision ever! 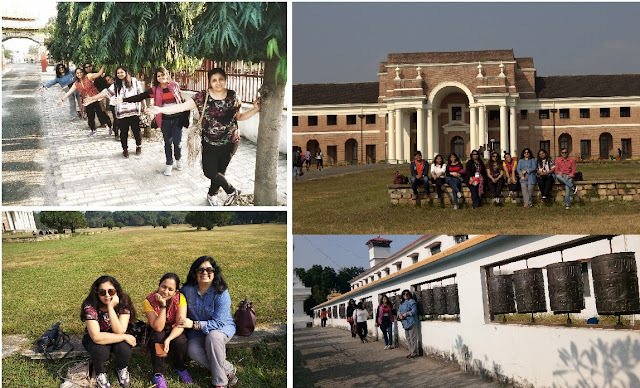 Reminiscent of school/college trips, we overgrown kids had a blast on the tour while visiting the splendid Forest Research Institute, the Mindrolling Monastery and finishing it off with a tour of the over-crowded Paltan Bazaar. The sleepy town that I had imagined Doon to be was far more crowded than the by-lanes of Mumbai! The actual BNLF event started later in the evening with a musical band that I have no recollection of and a Tibetan dance that was err...ho-hem! Again back to another indoor venue. IB entertained the audiences with the 'What Bloggers Hate to Hear' college-style gig. There was also a game that involved QR code screening that my mobile simply didn't comply with! A healthy bloggers debate on various blogging-centric topics ensued. Then came the presentation by UC News team, with a new initiative to increase the reach of bloggers. Some interesting keynote speeches by prolific bloggers followed by an IB award presentation for the literary/poetry sections raised cheer and also speculation on the much anticipated IB awards in other categories. I am a bit hazy about the sequence of events since it was well past midnight but I remember things winding up around 2 a.m with IB T-shirt distribution and the group photographs. The IB team despite the shortfalls of hosting the event in unfamiliar territory managed to liven the event and make happy memories for all. The event we'd been looking forward to attend for well over two months had officially come to an end. But not for me, and a small group of friends who had decided to stick on a day more, to well...just stick on and keep the party goin'!! We guys met up the next morning at the quaint Kalsang Ama Cafe for tete-a-tetes, more giggles, laughter and groupies! 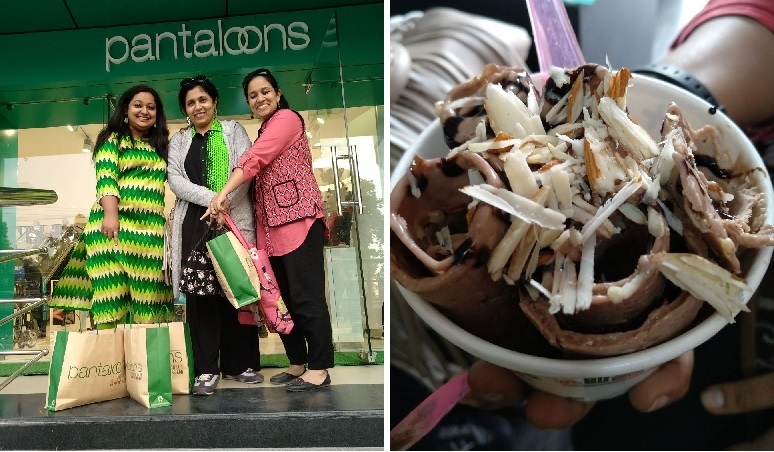 This was followed by some quality time spent with retail therapy and hand-rolled ice-cream, sealing the bond of friendship for us! And so, we come to the end of my little narrative on the BNLF, Dehradun 2017 experience. Wait a minute, I never mentioned the VoW, did I? Oh, yes, it had a lot of talks by famous, upcoming and wannabe speakers from the literary world. Yes, you guessed it, I didn't attend a single talk, I have attended far too many lit-fests in Mumbai and I consciously stayed away from any intellectual stimulation! I did visit the numerous stalls of tribal handicrafts exhibited at the venue and sated the incurable shopaholic appetite. Live without expectations and you shall not be disappointed! Yes, it was not the best-planned, high profile, goodies endowed event I've attended but I can happily say, I came away with loads of goodwill, new bonds with some really wonderful people, heartfelt affection from kindred spirits and a whole lot of sweet memories! Serendipity at its best for me! In case you are really curious to know about the various aspects of BNLF that I have not covered, you could visit any or all of the following bloglinks of my dear blogger friends.